Indoor cats have a lot of time on their paws, staying at home all day while we're away from the house. They have a very relaxing life, but just because your cat lives indoors, doesn't mean that her life has to be dull and boring. Cats are smarter than you may think, and some may get into trouble when not given sufficient mental stimulation and enrichment. Providing mental stimulation and physical exercise helps to combat boredom, decrease stress, and improve quality of life in pet cats as well as pets in the shelter. Think of it as the feline version of Sudoku. Some cats are motivated by food, and providing toys that dispense food if she manipulates the toy in just the right way, is an easy way for her to entertain herself while you are away. You can even transition your cat to eating meals from food toys, but before removing her food bowl make sure she's able and willing to remove the food from the toy. Cats can become very sick if they do not eat for as little as 2 days in a row, so waiting for her to figure out how to use the toy while not providing an additional food source is not recommended. There are many different options for food toys these days. It will take some trial and error to figure out which toy is best for your cat. Always start by supervising your cat to make sure the toy is safe for her. Make sure she doesn't chew off and eat pieces of the toy or get her paws or claws stuck in it. I recommend starting with a toy that you can make easier to start with such as SlimCat®. Some cats become frustrated or, more likely, give up easily. Once your cat learns to use the toy, you can make the holes where the food falls out smaller by turning the dial. You can also make food toys by cutting holes in a plastic water bottle or cardboard toilet paper roll. 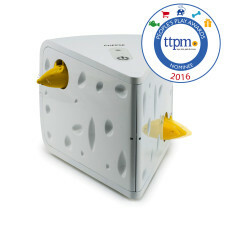 As your cat learns to easily extract the food, make new toys more challenging by cutting smaller holes in them. 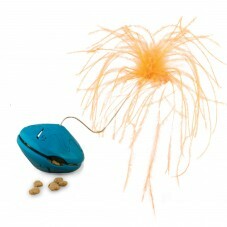 Take a treat-dispensing toy and start by placing your cat's favorite treat in the toy to make the toy more enticing. The smellier, the better. Puzzle boxes let you fill the holes with dry food and treats. Your cat reaches her paws in to "fish out" the prizes. Live crickets help to satisfy your cat's hunting instinct. Purchase a few from the pet store and give them to your cat in the bath tub to lessen the chance of a cricket escaping and chirping in your house all night long. Rotate toys so that your cat doesn't get bored with one toy. Other non-food enrichment toys include interactive toys, independent play toys, and electronic toys. Interactive toys are those you play with your cat with. Scheduling 10-15 minute play sessions twice daily strengthens your bond with your cat and provides her with great enrichment. Avoid toys that encourage your cat to play with your hands. Encouraging your cat to bite and scratch you can be painful and dangerous. Instead, use wand-type toys such as peacock feathers or fishing pole toys designed for cats. Some make squeaky noises that help to keep your cat interested. You can also toss balls or wadded up paper for your cat to chase after which encourages physical exercise. There are many independent play cat toys. Some are designed to hang from the back of the door, so they move when your cat swats at them. Others are battery powered such as Cheese Cat Toy and Undercover Mouse®. The Twist 'n Treat Teaser™ and Doorway Dangli™ combine a food-dispensing toy with an independent play toy. Shelters may use food and self-play toys when they are open to the public. It can be very endearing for potential adopters to watch a cat bat at a ball dangling from the top of the cage as well as relieve boredom and combat stress during the hustle and bustle of the day. Interactive toys are also a great way for potential adopters and cats to have fun interacting with each other. Now that you are armed with this information on how to reduce boredom and stress using various toys and enrichments for your indoor cat get out there and have fun picking out and introducing your cat to new and entertaining toys! You will probably have just as much fun as your cat does.